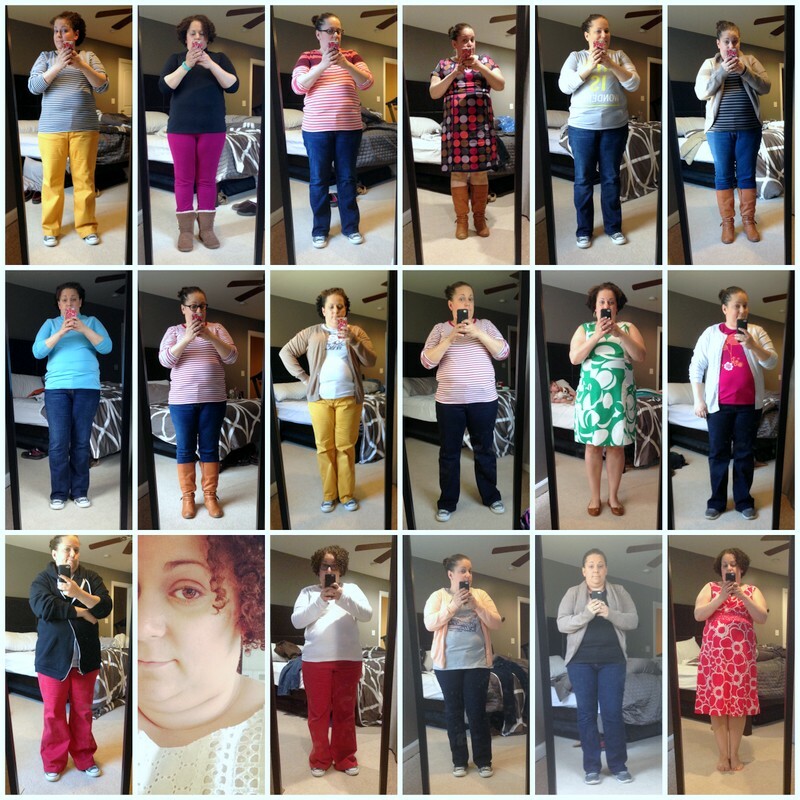 I forget about this project a lot, and April was definitely a regression into lots of yoga pants (those would probably be the days missing photos). I have really, really been digging striped shirts since I was pregnant with H, after a lifetime of avoiding them. I need a haircut (scheduled for tomorrow!). Too many ponytails. It’s already May 7th, and I’m just getting to this post. Lots of THINGS happening here. I miss wearing dresses, but not that white eyelet dress (purchased for a specific purpose, not to be fabulous). April was the month I’d hoped to complete my blog redesign. It is still in progress, and since the Reeves have a European adventure coming up I don’t think I’ll be working on it much in May, either. Which is a shame, because I can tell you that it is pretty awesome. I’m knee-deep in my online Illustrator class, which is great but stressful. It’s stressful because, in addition to finding time for this class, I’m also trying to find time to write, pimp my quilts, and explore all kinds of new opportunities and cool things. And I’m trying to do all of things with a two-year-old who has all of a sudden developed separation anxiety since coming home from our DC and Lancaster adventures. We’d avoided this entirely up till now, with a little girl who was generally perfectly content to spend time with people who were not her parents. But it’s been rearing it’s head since spring break ended. This means a lot of the carefully planned out strategies I had been using (like my mother’s helper) to get a little work time away from the little one are currently backfiring. I spent a tremendous amount of time last weekend working out a master schedule for myself (and, by extension, for H). I had the epiphany that my WAHM balance issues weren’t just the result of switching from an outside the home job. My outside the home job was also incredibly regimented; as a teacher my day was structured into 40 minute segments, and I had memorized a Big Picture plan for each day and what I needed to accomplish. Plus, I had lesson plans. I think if I was working in an office, I’d be having the same balance issues. So, I decided that the first step to conquering this was to have a master schedule just like I had as a teacher. And then I can work within the framework of that schedule to, essentially, create lesson plans for myself and H to be more efficient. And I’m kind of stoked about this schedule. I carved out 30 hours a week of work time (which, by the nature of life, will also have to include some errands and chores in there). I carved out time just for H and I to do things, I scheduled workouts 4 days a week (because someone in this house has gained 7 pounds of stress-eating weight since the separation anxiety set in, and let’s just say it wasn’t the toddler). I’ve also scheduled in meals (which I forget to eat. A lot. ), and some time for chores and errands (but certainly not enough). I misread the sentence “my WAHM balance issues” and thought you were admitting to an obsession over George Michael and Andrew Ridgeley.